Now there is a Doctor Who Tardis Doors Hoodie based on the latest Tardis. So on the dark blue hoodie you can find the doors like on the Tardis of the 13th Doctor Who and all the signs and stuff can be found on the front too and the top sign of the Tardis is also printed on the left sleeve. You can get this Doctor Who hoodie in men’s sizes XXSmall – 3XL and will look great on women too. This Tardis hoodie is made from 80% cotton and 20% polyester. 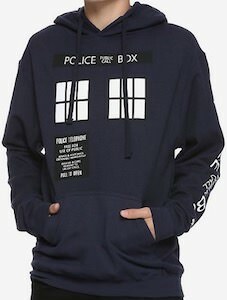 So if you like a nice and warm hoodie then you should check this Doctor Who sweater out. 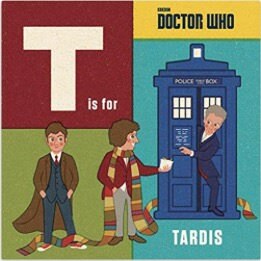 Now the little Doctor Who fans can learn the alphabet with the help of this T Is For Tardis Book. The book is a nice picture book and all the pictures inside it are related to Doctor Who and they also teach you the alphabet as it for instance says “A is for Angel” and then I shows Weeping Angels, Amy Pond and even an Adipose. And the rest of the book does something similar for the rest of the alphabet. The hardcover book is 60 pages and also comes as an ebook. Made for kids 9 – 12 (grade 3 – 7) and will be loved by all the Doctor Who fans. Now you can sleep in Doctor Who style thanks to this Women’s Light Blue Tardis Pajama Set. The Doctor Who pajama set is light blue in color with a darker blue waistband, neckline and cuffs and on the whole pajama you can find many images of the Tardis just floating around. And this is not just any pajama this is a thermal sleep set so it will keep you warm on this cold nights or days if you like to lounge around in it. You can get this Tardis sleep set in women’s junior sizes XSmall – 3XL and they are made from 60% cotton and 40% polyester. Doctor Who fans can be ready for winter all thanks to this 13th Doctor and Tardis Beanie Hat. 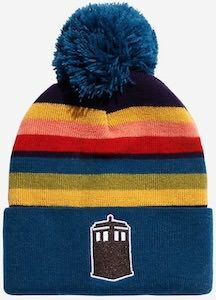 The winter hat has the colors of the shirt of the 13th Doctor complete with the colorful stripes and a pom pom on top and to make sure people really understand that this is a Doctor Who beanie hat they added the Tardis on the rim of the hat. The hat is made from acrylic and just looks fun and does make it clear to other Doctor Who fans that you like the first female Doctor. Doctor Who fan now there is a The Doors Of The Tardis T-Shirt Dress. The women’s dress is made from 99% cotton and 1% spandex and it is available in women’s junior sizes XSmall – 3XL and also in plus sizes. The back of the t-shirt dress is just empty with the exception of a small Doctor Who logo. On the front you can find the doors of the Tardis complete with the top sign and the new door sign that has shown up with the 13th Doctor. 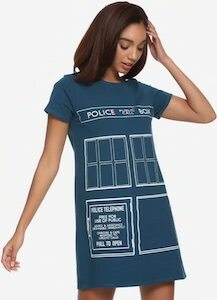 A fun Doctor Who dress like this just looks great on its own but you can even combine it with pants and wear it as a long t-shirt. Now Doctor Who fan can be wearing this Tardis Hooded Cardigan. The cardigan is dark blue in color and has a hood and besides the blue that are on the top and the bottom section that shows a fair isle like print that even include some snow flakes and many images of the Tardis. You can get this Doctor Who cardigan in women’s junior sizes XSmall – 3XL and they are all made from 100% acrylic. Now you can stuff you hands in the pockets of this Tardis cardigan and be all nice warm and comfy and enjoy winter. Now there is the perfect Tardis trinket tray for all the small things a Doctor Who fan has lying around. 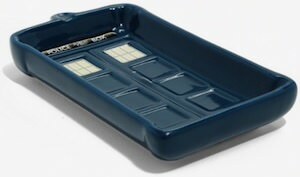 The Tardis tray is made from ceramic and is Tardis blue with the inside having the doors of the Tardis. The tray is 4 1/2 x 2 inches. A trinket tray is great for collecting all those small things. If you take jewelry off at night then why not put them in this Tardis tray so that you know where they are tomorrow morning. A little tray like this can be perfect at your nightstand or dressing table and I am sure that all Doctor Who fans will want one. 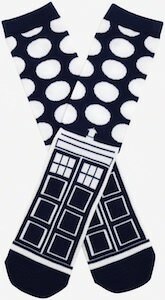 Doctor Who fan that need socks should check out these Tardis And Dalek Dots Socks. These Doctor Who socks are dark blue and the top of the socks have white dots on them that remind all the fans of the Dalek and then the foot part of the socks have the Tardis on them. These Doctor Who socks are great for men and women and are made from 98% polyester and 2% spandex. So now your feet will be warm and surrounded by the Dalek and the Tardis and that has to feel great on the feet of a true Doctor Who fan. If you want to be warm can comfy while watching Doctor Who on TV then you should check out this fleece Tardis onesie. The Doctor Who onesie is made to fit men and women and comes in sizes Small – 3XL and it is made from 100% polyester fleece and that makes them really comfy, soft, and warm. 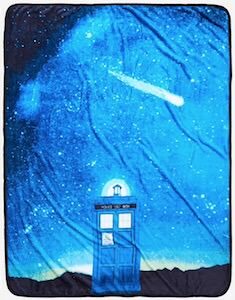 The onesie is Tardis blue with the windows and door sign on the front and then on the sleeve it says in big white letters “Doctor Who”. The officially licensed lounger has a hood and one big zipper on the front. You can use this Tardis onesie as sleepwear, loungewear, and even as really comfy Halloween costume.